Alright boys and girls, it's time to have some wacky adventures with the Looney Tunes cast! 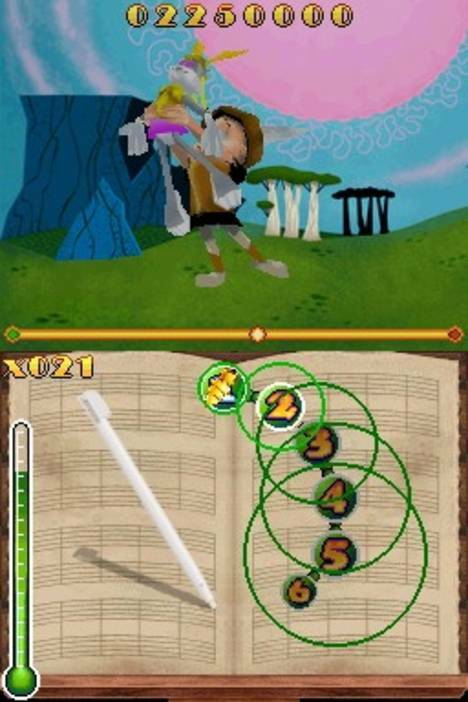 Well, not so much wacky adventures as recreating classic scenes from the old cartoons via a rhythm game. So, how awesome is Looney Tunes: Cartoon Conductor? Is it going to be the game that kills Taiko Drum Master and Elite Beat Agents as the next big-hit title, with a surprise debut during the summer? You know what's coming next. Hit the jump. 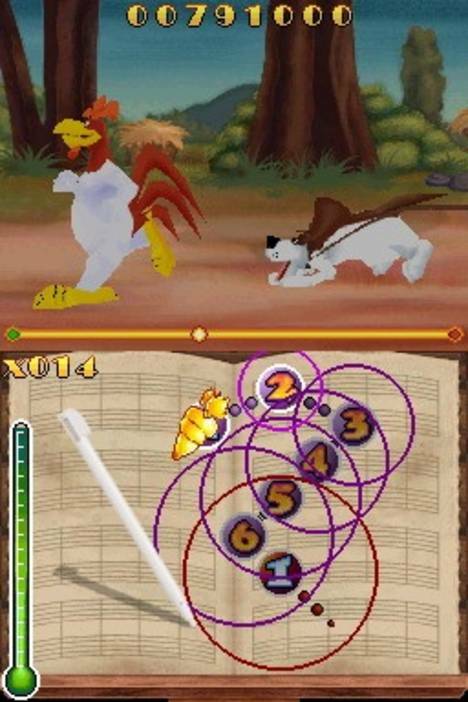 Some games are defined by their gameplay mechanic. Katamari Damacy, Elite Beat Agents, and Taiko Drum Master are all incredibly fun, simplistic, and accessible by just about anyone. That mechanic instantly becomes iconic with that title, too. What happens when you rip off that mechanic, but change it ever so slightly so as to not look too bad? Well, it kind of screws the whole thing up. 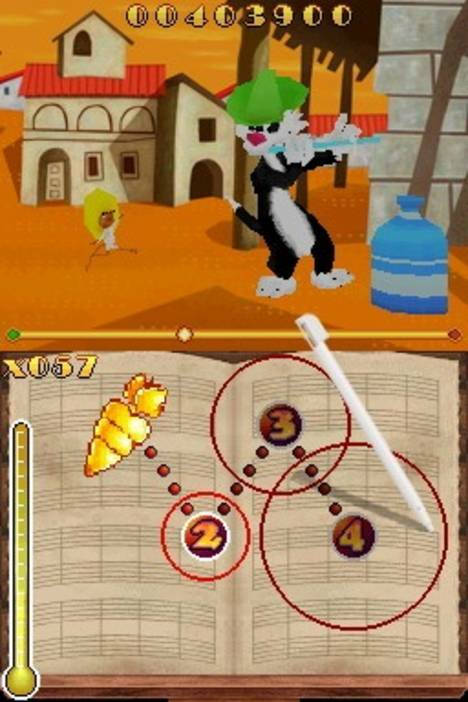 Looney Tunes: Cartoon Conductor is essentially Elite Beat Agents, but intsead of tapping the all of the buttons, you tap the first button and slide to hit the rest of the notes in the chain. It's a small difference in how the notes are hit, but it makes the game nearly unplayable. Perhaps it's because I've been so used to hammering out notes in Elite Beat Agents that I can't go and change how I play the game. The biggest thing to adjust to was the timing between tapping the first note, and then dragging it to not just the next note, but timing the rest of the combo as well. A lot of the timing is learned by doing it wrong, and then trying it three or four times before. The game seems to operate on a system of punishing you until you learn how that specific level works. It wasn't just me, either. I handed the game off to several other people who had played EBA as well, and they had the exact same feeling. It was impossible to make it through. Alright, let's assume, for the sake of argument, that this game is not meant for me, and is instead intended for a young children's audience. There are two things I need to question. First is an aesthetic aspect. 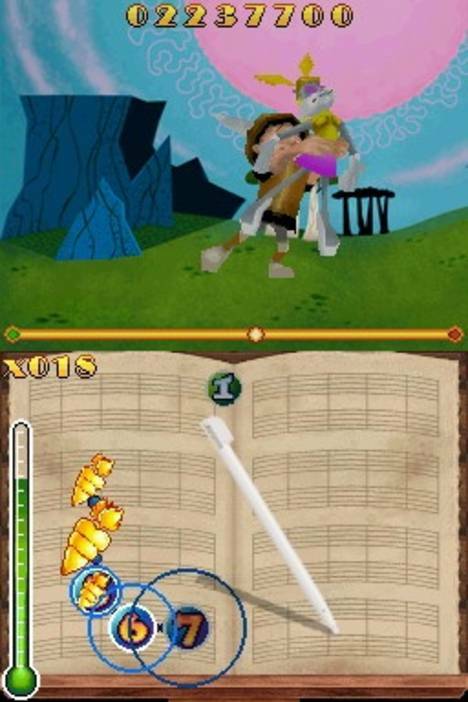 In EBA, as you play through a level, the video up top tells a story. Your performance in the game determines how the video up top plays out. Usually, you have to play through several times to catch everything that's going on. 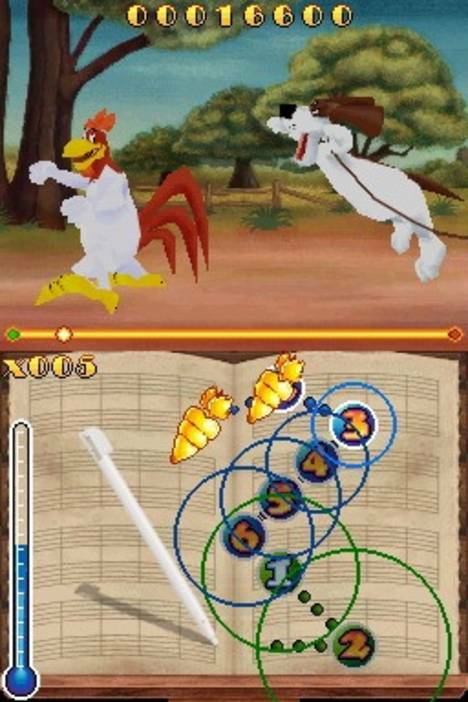 The problem is, the video in LT:CC seems to rely on the person having already seen the cartoons that are partially recreated in the game. Now, I'm not sure that young kids actually have that great of an exposure to classic Tex Avery works. I grew up on them thanks to their prevalence on Cartoon Network and on Saturday mornings. The problem is, those things are changing. Older content can now only be found on Boomerang or AMC. So unless you have digital cable, there's a good chance that the child playing the game in question is not necessarily familiar with the clip, and all that's going on. The second problem I had with the game was the levels of difficulty. There were major jumps between the easy, medium, and hard levels, something that I had a hard time dealing with -- something that I would imagine to be game-breaking for a younger child. The game would throw in notes that I had trouble comprehending why they had placed there. I mean, I was used to how Symphony No. 5 played -- I've nearly perfected the song on Oni difficulty in Taiko Drum Master -- but there were placements in areas where no new notes were being played. 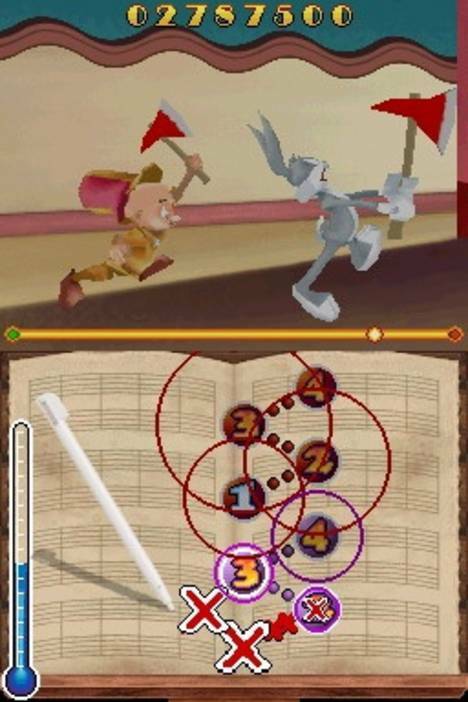 The game's song selection is all classical music, which is about the only thing that fits Looney Tunes well -- many of the original cartoons used it. But how many kids know how Gustav Holst's Mars, Bringer of War goes? I only learned about the song two years ago. That's a big part of the choice in song selection: picking songs the user likely knows already, and I don't think many kids will know a good portion of the 18 songs included in the game.